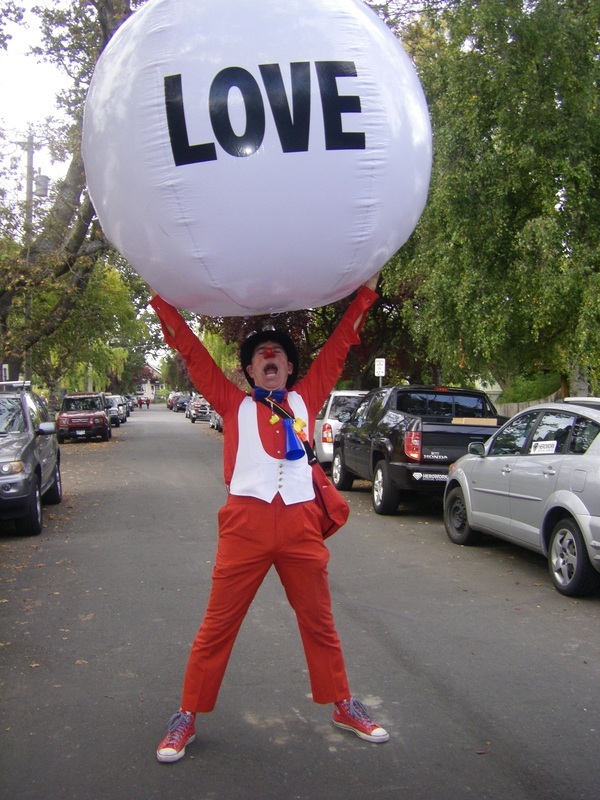 FROM THE SUNSHINE CLOWN TROUPE! which is seen by over 150,000 people each month throughout BC. Click the button to view the article. 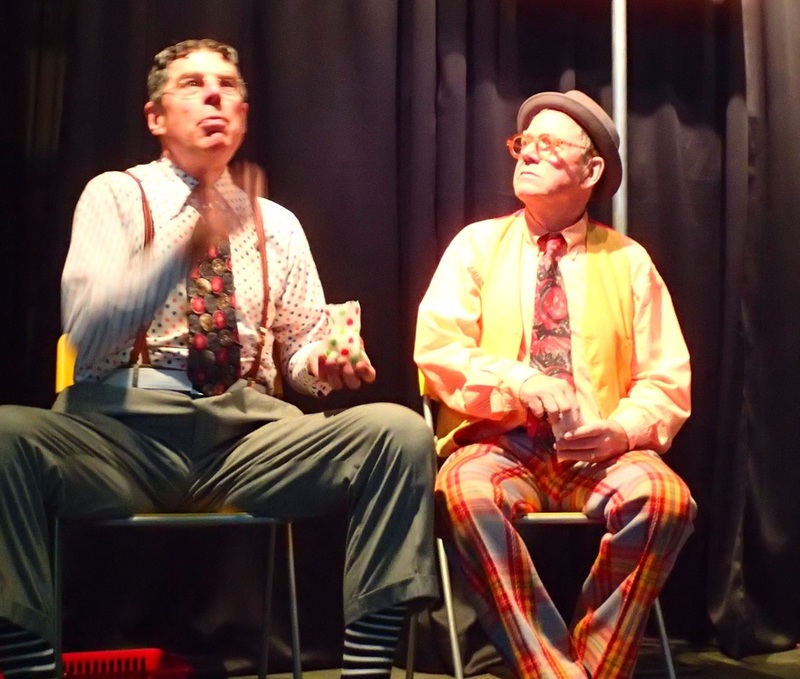 In celebration of our 9th birthday we attended a performance in Vancouver of ANYTHING by Mump and Smoot. In addition to being totally inspiring it felt like a family affair: A couple of months earlier Holliday and Moore had performed at a residence in Victoria where, at the end of the show, a nattily attired gentleman identified himself as Mump's father. (Our boys were unabashedly demonstrative in their fawning adoration! Shoes were kissed!) Then, during the performance of their show, Mump chose Scott's daughter Emily to come on stage as a participant. Later in the lobby, to everyone's delight, the Full Circle was revealed! 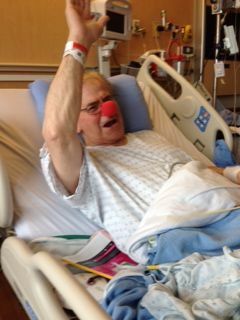 The Sunshine clowns are going to the hospital !
. . . or did he say "left"? 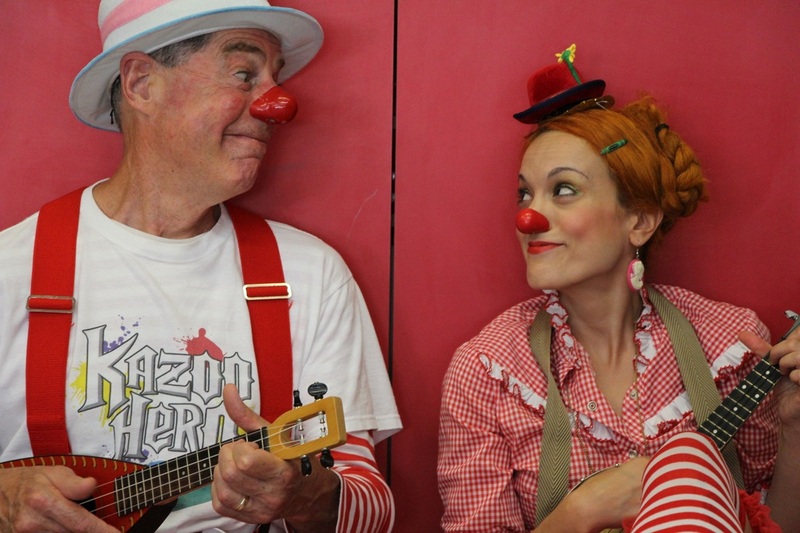 We are happy to welcome Blossom (aka Phyllis McGee) as our newest Sunshine Clown. She is participating in both the care and performance branches of the society. Mimsy's Needle Felt version of the Sunshine Clowns!!! 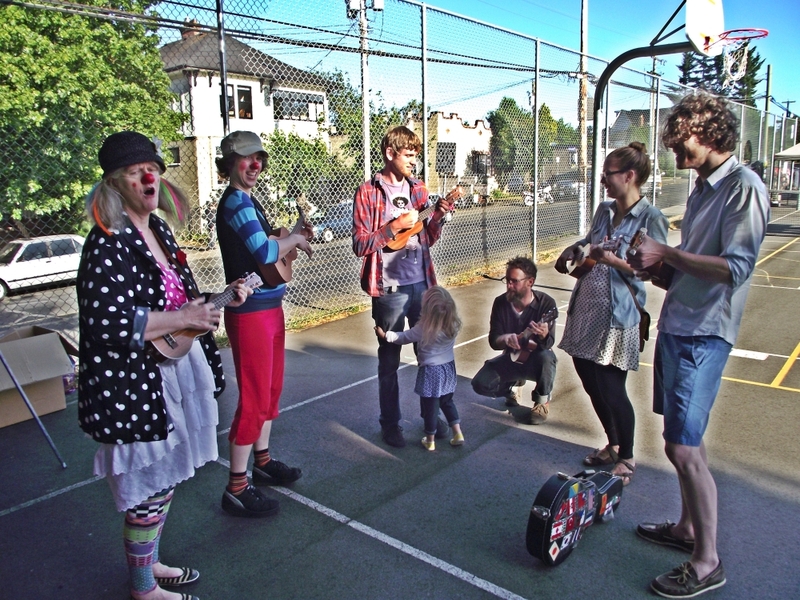 Special thanks to Paul at Larsen Music for the loan of enough ukes to get everybody strumming! 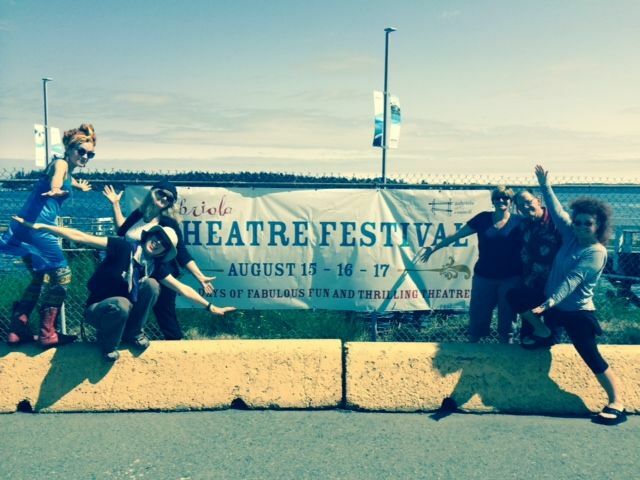 We had a lot of fun visiting Gabriola Island, and performing our newly edited Tea Time Show. Please, sit back and enjoy the (slide) show...! ... when the clowns come to visit. Almost all of our new clowns have now completed their observation shifts. As a next step they will be clowning side by side with one of our senior clowns. 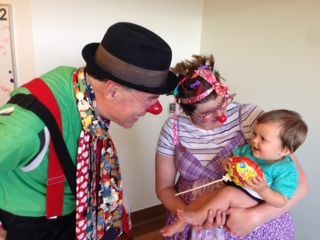 This week, Cahoots was very excited to have her first visit as a care clown. She and Stretch had such a great time! Happy 9th Anniversary to.... us!!! 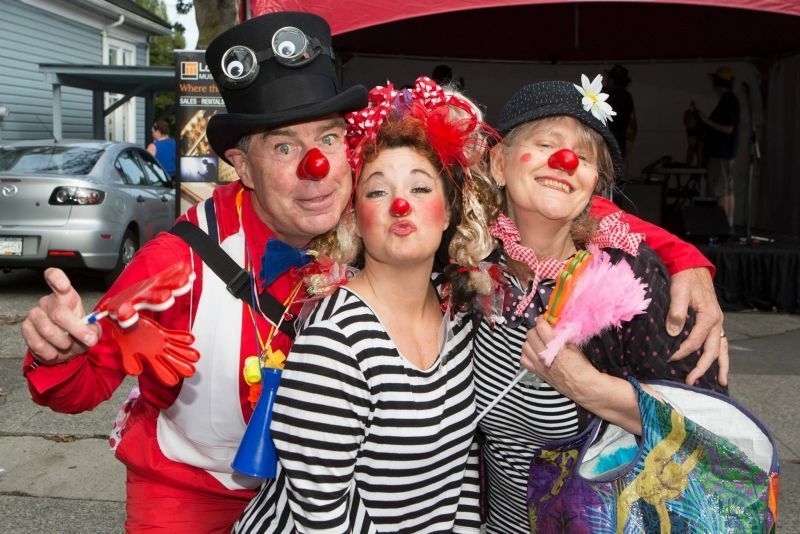 The Sunshine Clowns celebrated the 9th year of being a troupe this April. This picture was taken at the first show we ever did. It was for a volunteer group at the Victoria General Hospital. 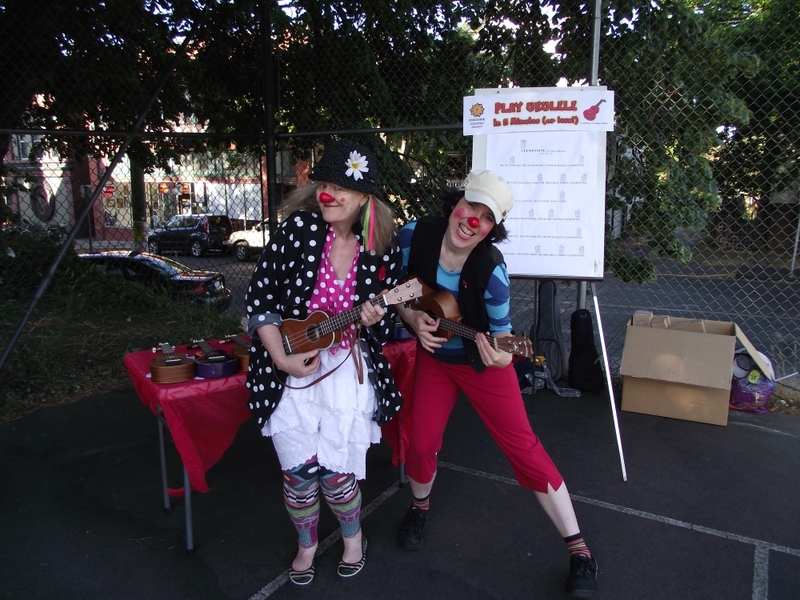 We were very excited to have been part of this year`s IN JEST Festival in Vancouver! 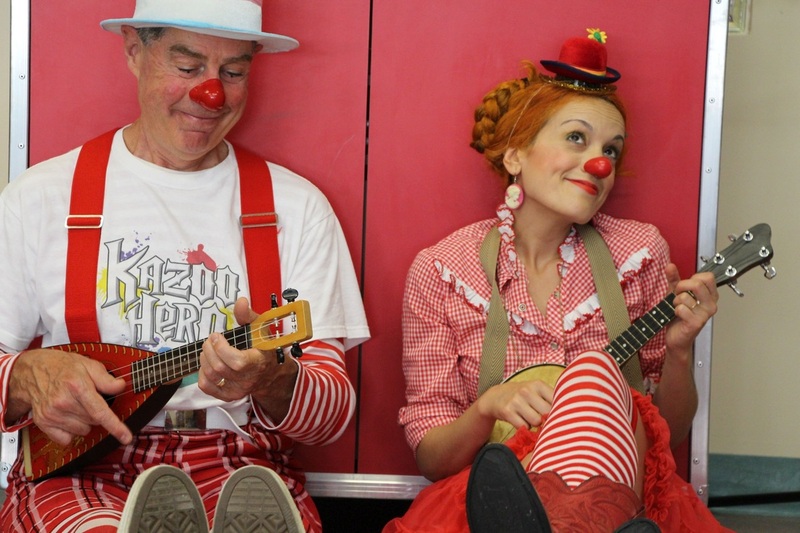 Amanda facilitated a Care Clown Workshop on May 3rd, and the following day, Jim and Scott gave a performance of their show DANCING WITH FISH. 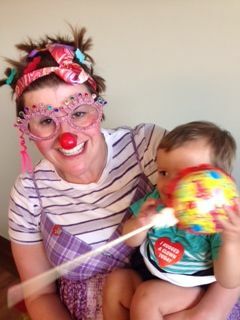 Clowns on tour.... We love it!!! 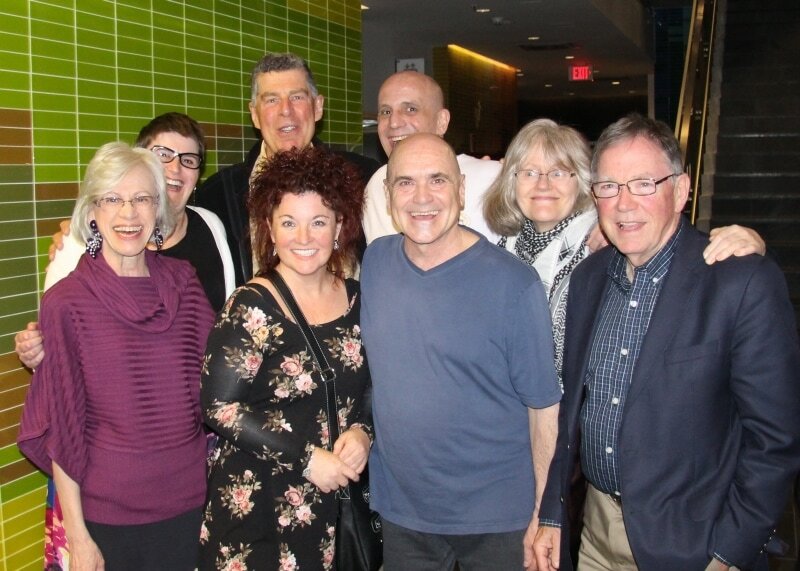 The World Premiere of DANCING WITH FISH on April 26, 2014 at the New Horizons Theater in Victoria was a great success! - A full house, a standing ovation, smiles & laughter... How does it get any better?!? Many thanks to the audience and to everyone who has been supporting this unique production! 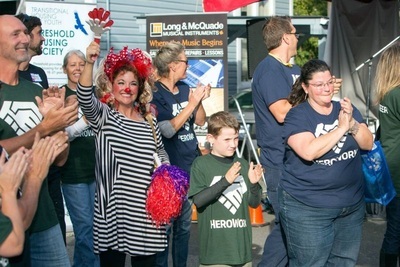 What a great group - fun-filled and ready to play! Shown above are our graduating students Ann, Bettina, Derek, Elinor, Janice, Suki, Emma, Maya. Back to school for the clowns! We were invited on March 11th to present our care clown work to a class of graduate students interested in research on performance arts in the context of helping. 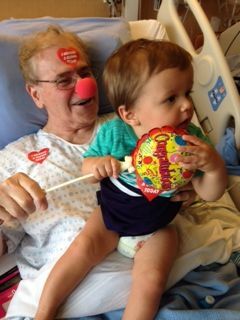 Following a brief history of clowning and care / therapeutic clowning in particular, we brought in the clowns to meet the students, and do a role play of a typical visit to an elder in a care facility. We also gave out hugs and stickers ("I Hugged a Clown Today") and sang a few songs. To round up the visit, there was a Q & A with Amanda, Rebecca, Jim and Scott. Below you can view a slide show of that day. 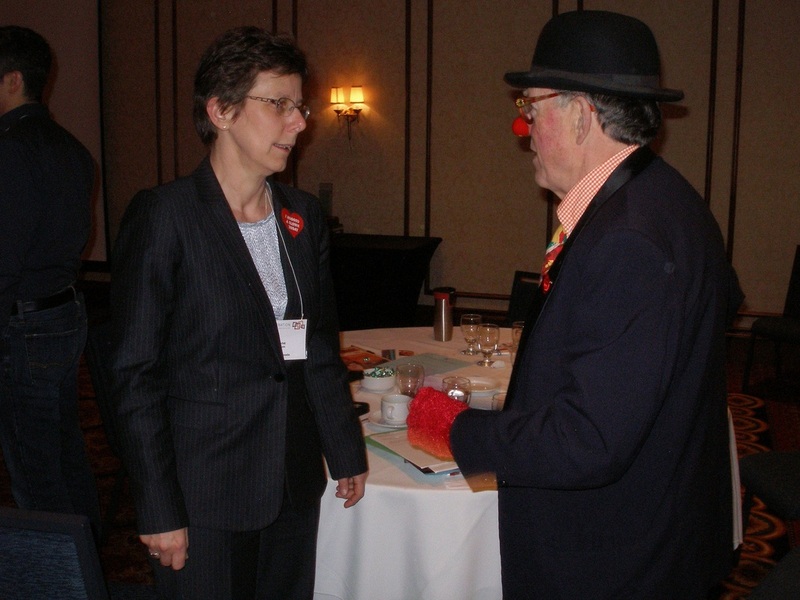 In February The Sunshine Clowns visited the Federation of Community Social Services of BC during a coffee break at their spring General Meeting in Victoria. The picture shows one of the attendees, Liz Wood from Sea to Sky Community Services. 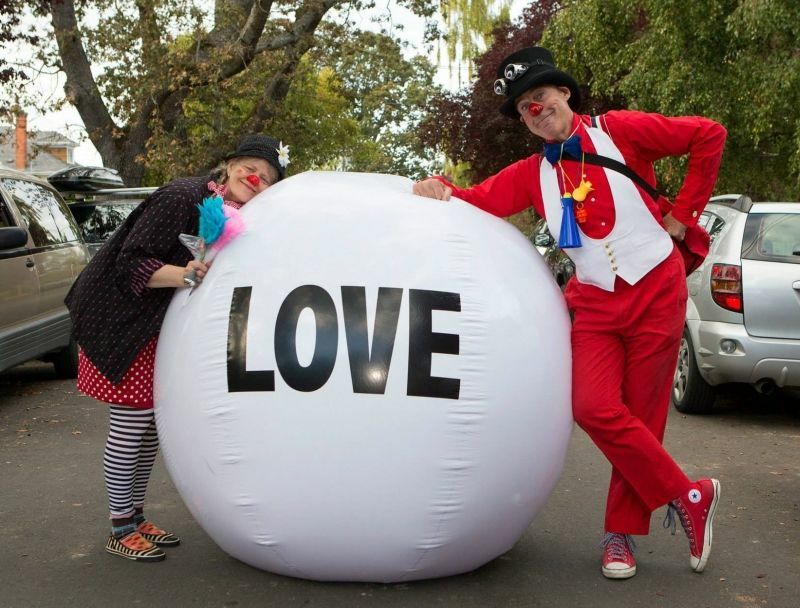 Liz said the clowns were "...a lovely interruption to the "work" of the Fed meeting". Bungle, of course, is never too shy to ask for his favourite thing - a back scratch; which Anne Nikon delivers beautifully as you can see below (please click on pictures to enlarge). Jim shows off our new stage screen, which provides a back drop, a back stage for changes or getting props, and a place for pigeons to roost. This will replace our big wooden screens which were a chore to haul around. This one folds up into a neat carrying bag! Dancing with Fish has many elements of classic clown logic as well as surreal images. Reality in the clown world is pliable and therefore, full of surprises. The show is based a lot on how Scott and Jim see themselves in their personal friendship and the issues that arise as a result of their own characters. The show is also characterized by a strong element of soundscape, comprised of music and sound to stimulate the audience's imagination. For the first time, a clown show has required a sound board operator to key the sound keys when needed. Another feature of this show is the acquiring of a choreographer, since there is much physical movement and some dancing involved. 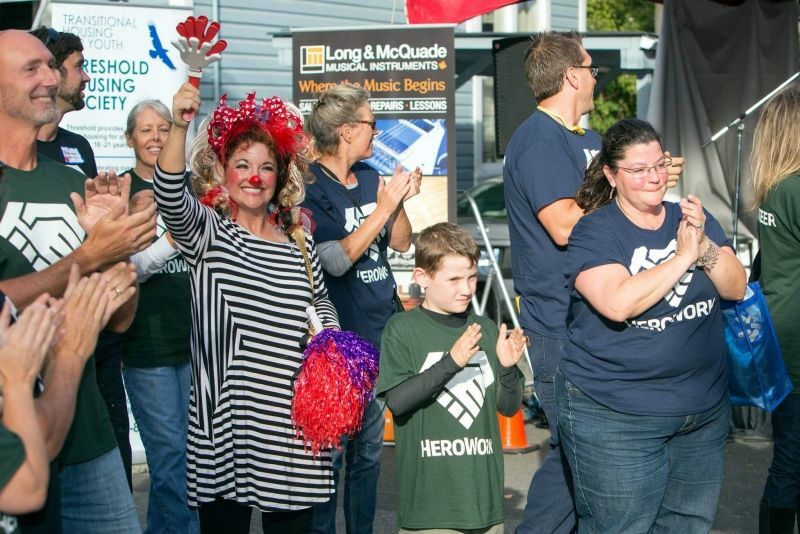 Holliday and Moore doing their "subway dance" over the strong beat of "Rescue Me!" 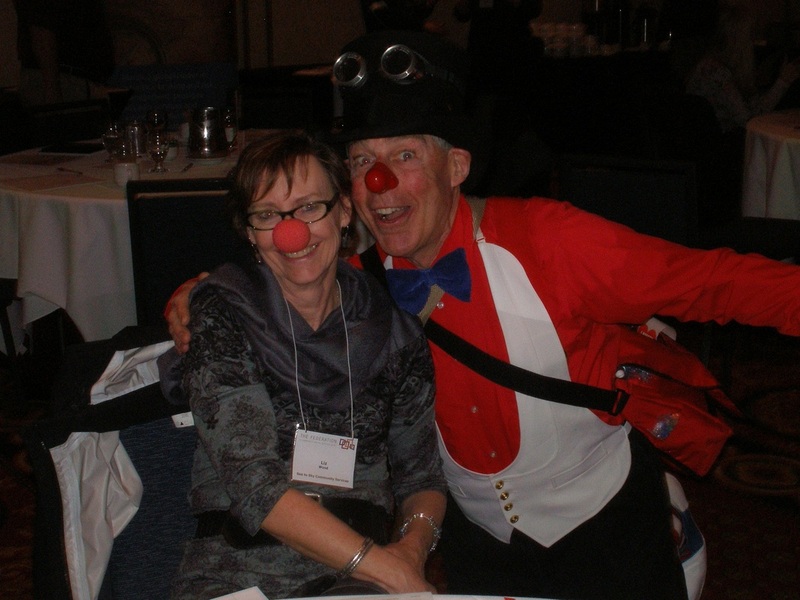 In the month of February, 2013 we ran a two-weekend course in clowning with a focus on Care Clowning. Here's our proud graduating class of seven. Shown in this picture are (Front row l-R) Rebecca Ataya - Clown trainer, Rosemary, Amanda Gafter-Ricks - Clown trainer, Anneke, and Leona. 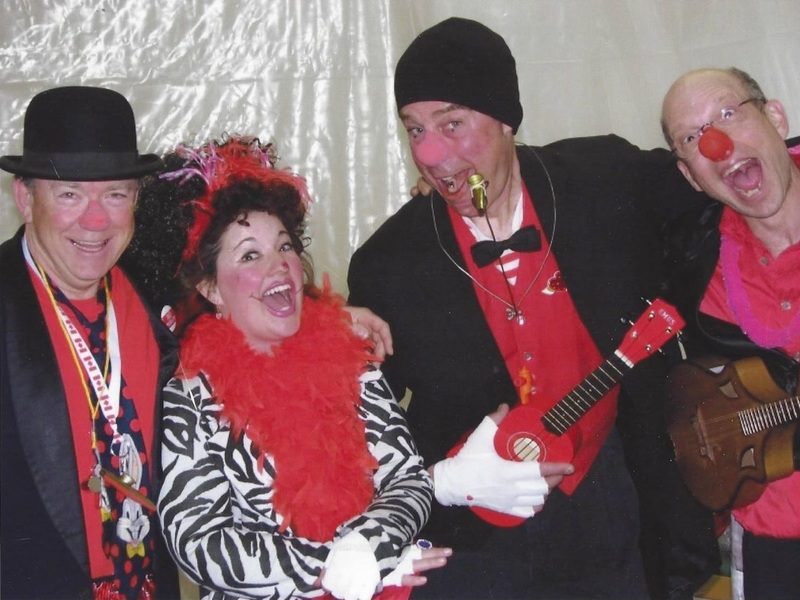 Back row (L-R), JoAnne, Jim Ricks - Clown, Karim, Trish, and Adrienne.